Preeclampsia is one of the most serious health problems affecting pregnant women. It is a complication in 2% to 8% of pregnancies worldwide and contributes to both maternal and infant morbidity and mortality. 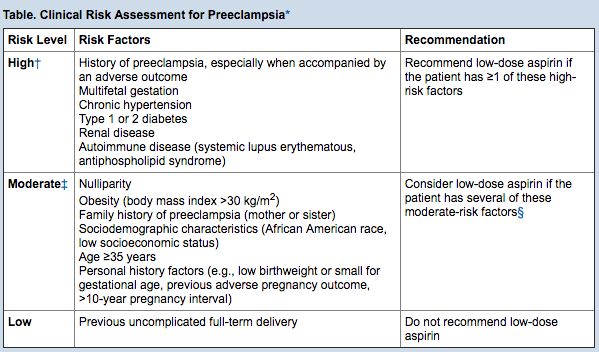 Preeclampsia also accounts for 15% of preterm births in the United States. The disorder is defined by the onset of hypertension (blood pressure ≥140/90 mm Hg) and proteinuria (≥0.3 g of protein in the urine within a 24-hour period) during the second half of pregnancy (>20 weeks). In the absence of proteinuria, preeclampsia is classified as hypertension with any of the following: thrombocytopenia, impaired liver function, renal insufficiency, pulmonary edema, or cerebral or visual disturbances. Important risk factors for preeclampsia include the history of preeclampsia (including early-onset preeclampsia), intrauterine growth restriction (IUGR), or preterm birth; placental abruption or fetal death; maternal comorbid conditions (including type 1 or 2 pregestational diabetes, chronic hypertension, renal disease, and autoimmune diseases); and multifetal gestation. Predictive models that combine risk factors to identify women at risk for preeclampsia, such as serum biomarkers, uterine artery Doppler ultrasonography, and clinical history and measures, are in development. None have yet shown sufficient accuracy for clinical use. The USPSTF found adequate evidence of a reduction in risk for preeclampsia, preterm birth, and IUGR in women at increased risk for preeclampsia who received low-dose aspirin, thus demonstrating substantial benefit. Low-dose aspirin (range, 60 to 150 mg/d) reduced the risk for preeclampsia by 24% in clinical trials and reduced the risk for preterm birth by 14% and IUGR by 20%. The USPSTF found adequate evidence that low-dose aspirin as preventive medication does not increase the risk for placental abruption, postpartum hemorrhage, or fetal intracranial bleeding. In a meta-analysis of randomized, controlled trials (RCTs) and observational studies of women at low/average or increased risk for preeclampsia, there was no significantly increased risk for these adverse events. In addition, there was no difference in the risk for placental abruption by aspirin dosage. The USPSTF also found adequate evidence that low-dose aspirin as preventive medication in women at increased risk for preeclampsia does not increase the risk for perinatal mortality. Evidence on long-term outcomes in offspring exposed in utero to low-dose aspirin is limited, but no developmental harms were identified by 18 months of age in the one study reviewed. The USPSTF concludes that the harms of low-dose aspirin in pregnancy are no greater than small.